Wear a special reminder of your hometown, yearly getaway, or a celebrated landmark. No matter how many years have passed or how many miles away you are, with this bracelet you can wear a special reminder of your hometown, yearly getaway, or a celebrated landmark right on your wrist. 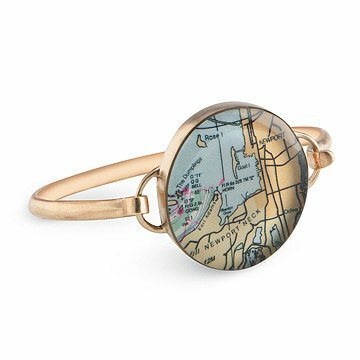 In this bold, wearable memento, clippings from reproduced maps or charts are customized to the coordinates of your choosing, sealed, and set in a bronze bezel connected with a hinged band. Each unique travel companion provides you with a link to your past and an inventive way to keep the memory of your favorite place on hand. Handmade by Charlotte Guptill in Maine. International locations available, but maps may less detailed. Add extra personalization with a custom message engraved on the back of your bracelet (up to 25 characters). The bracelet looks lovely and my wife is very happy with the appearance. It is somewhat difficult to clasp- yet unclasps very easily while on the wrist.This bracelet is copper and bends/loses shape easily. I received this bracelet as an anniversary present. I loved the custom look to it. The map is of the location where my husband and I got engaged. It's a lovely bracelet, and I love the bronze metal! The map is of high quality, which is wonderful. I love the detail! Unfortunately, I would not describe myself as having dainty wrists. I also had a baby 3 months ago. While this bracelet fits, it does not fit comfortably. I took it to my jeweler to see if they could perhaps stretch the metal to a larger size, but this is not possible because the material is too brittle. So I'm stuck with a beautiful piece of jewelry that is uncomfortable to wear! I'm so sad and embarrassed that I can't wear this present from my husband! I love it and he was very proud of the find. I also can't return it or resize it. Maybe I'll pass it down to my infant daughter in 10 years. Until then, it will sit in my jewelry box... lonely and sad. A beautiful keepsake for your special friends. The map I requested was perfectly duplicated and the bronze bracelet very pretty. The quality of this bracelet is incredible! I was pleasantly surprised when I took it out of the box that it was even more gorgeous than it looked online. The only negative I have is that in order to clasp the bracelet you have to push on the band, and if you aren't very delicate, the metal will bend and the bracelet loses it's shape a bit. This changes the tension and therefore makes it harder for the bracelet to clasp properly. I bought this as a gift for my stepmother who is very hard to buy for. As soon as she opened the gift, she was delighted!! She said that she hasn't taken it off since I gave it to her at Christmas. It's perfect!